Our silent ancestors: (a book specifically aimed at the non-specialist) has been written to tell the story of our unknown ancestors, the silent and resilient people who inhabited the eastern and north-eastern areas of Ireland for many thousands of years. They left little writing, many of their stories and language are lost in time and we only have tantalising glimpses of what their lives might have been like. Their story is told through the shadows they left in the soil; the burnt charcoal, cremated bone, seeds, plants and occasionally pottery and other simple belongings they left behind. Sometimes their very bodies were no more substantial than an outline in the earth, so thoroughly had their skeletons crumbled away. These items were found in a series of archaeological excavations that were carried out in 2006 along the route of the Bord Gáis Éireann pipeline, which was constructed along a corridor stretching from County Meath to County Antrim. The pipeline extends from south to north; the sites run like a tunnel through time coming forward from the Neolithic or Stone Age to the later medieval era; and they may be said to move, also, along a very slow curve of advancing technological knowledge in our society. This story of people and society is told through the medium of archaeology. It is a story but not a fiction; archaeology at all times tries to be accurate, objective and evidence based. Archaeology is a detective story told in soil; bone; plant, wood and objects. Few disciplines outside criminal forensics can be as meticulous as archaeology in checking every tiny clue to build a true story of what happened in the past. So, the intent of this book is to make available the story of this area and the finds discovered in the gas piple line corridor to the general reader. 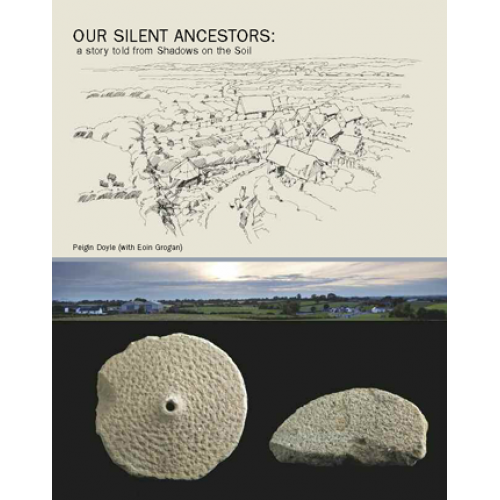 Accompanied by stunning landscape and artefact photogrpahs by Jonathon Hession and compelling reconstruction illustrations by Dave Pollock this is a new departure in the reporting of development led archaeological work in Ireland. Peigín Doyle is a writer who has been deeply interested in history, archaeology and heritage from her teenage years. She worked as a sub-editor with the Irish Press, Women’s Way and the RTE Guide and was the public relations consultant to the Institute of Technology, Sligo. As an editor and writer she worked with the Combat Poverty Agency and other community-based organisations. She has an MA in Political and Public Communication and she writes creative fiction. She contributed to photographer Hugh MacConville’s book Ireland’s earthen houses, and wrote, with Professor George Eogan, Guide to the passage tombs of Brú na Bóinne.